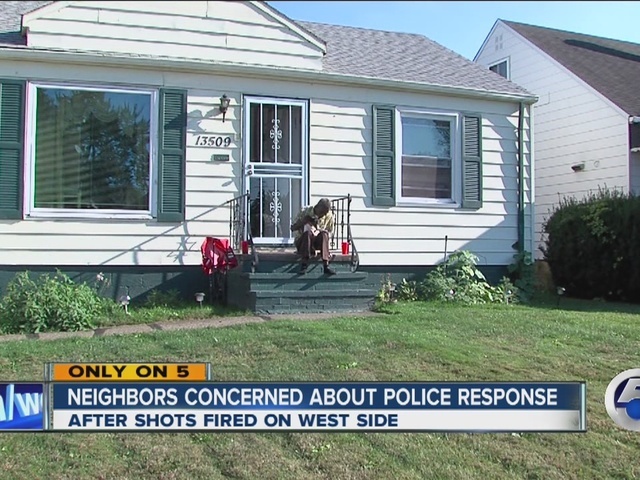 Shots fired during a drive-by on Cleveland's west side has some residents questioning police policy when responding to calls. Isaac Nelson said he heard at least six gunshots outside his home near West 135th Street and Bellaire Road at about 11:45 p.m. on Wednesday. Terrified, he hid under his bed because his bedroom window faces the street, and immediately called 911. He sat and waited, and said no police officers came by to speak with him. So half an hour later, Nelson called 911 again, once again requesting police to come out and investigate. Cleveland Police told newsnet5.com that a zone car was sent out, and according to their radio logs, arrived at the location at 11:51 p.m. They radioed back and said they were "unable to locate" and it appears they did not make contact with witnesses. Nelson and other neighbors, concerned about the lack of response, called police again Thursday morning, after finding two shell casings out in the street. Officers eventually responded and made contact, collecting the casings for evidence. Police said their policy for shots fired calls is for a zone car to drive by and check for an injured person or property damage. Then officers see if anyone will flag them down. If they don't, they will typically move on if they don't see a person injured or property damage. For residents like Victoria Rivers, the mother of a 1-year-old child who also lives on Bellaire Road, that doesn't seem like quite enough. "Not to be rude, but that's your job," Rivers said. "At least come investigate and make sure nobody is hurt, make sure nothing did happen."